Season finales, the last show in a series, the end of an era… when a TV programme comes to an end (or season, depending on where you are) there’s a high expectation the writers will make it a classic. This isn’t always the case. The Sopranos became notorious for its unclear ending of whether the main character, Tony Soprano, died or not. On the other hand, Breaking Bad‘s ending, which resolved the fate of Walter White, Jessie Pinkman and the others, won rave reviews. The reason I used those two examples is that both The Sopranos and Breaking Bad were generally and consistently well-reviewed, so the endings had a high expectation of being of equally good (and ideally better) quality. Yet how do they compare to other series? 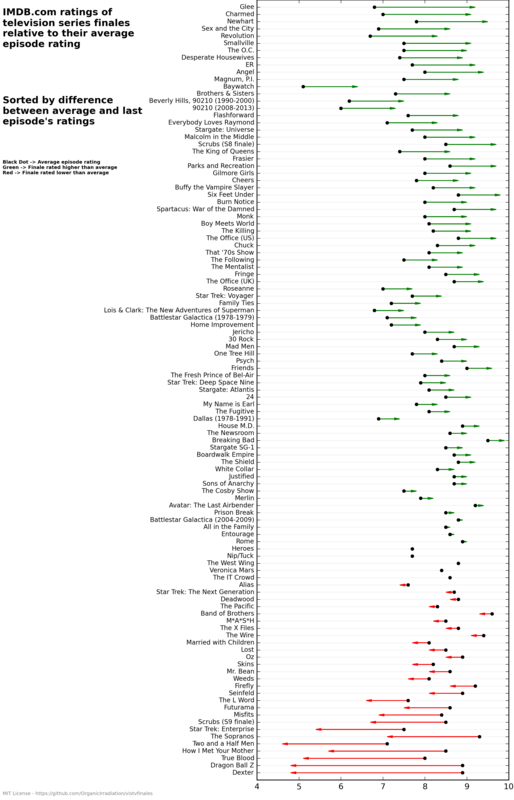 Two Reddit users, PhJulien and ChallengeResponse, have done something clever I wish I thought of — getting the data from IMDB and comparing finales with average ratings. IMDB not only lists every episodes but also collects user ratings. More importantly, it lets you get at its data. What ChallengeResponse did was write a Python program to get the data and then made a chart ranking the difference between the average rating and the finale rating. He’s ranked this by the biggest difference, so that Glee, the school where the singing never stops, which got around a 6.8 average, had a finale with 9.2. I’m reading the charts for these numbers so may be off, but that’s a difference of 2.4 rating points. At the other end, Dexter, the show about the serial-killer killer, caused a stink with viewers, dropping from its average of 8.9 out of 10 to 4.8 in the finale, a drop of 4.1 rating points. Another, earlier, way to look at this is through PhJulien’s chart, which scatters average rating to finale. Looking at it this way, Breaking Bad, which had an extremely good average of 9.0 for its series as a whole, went out with a 9.9. So a good show went out almost perfectly, according to public rating the show on IMDB. 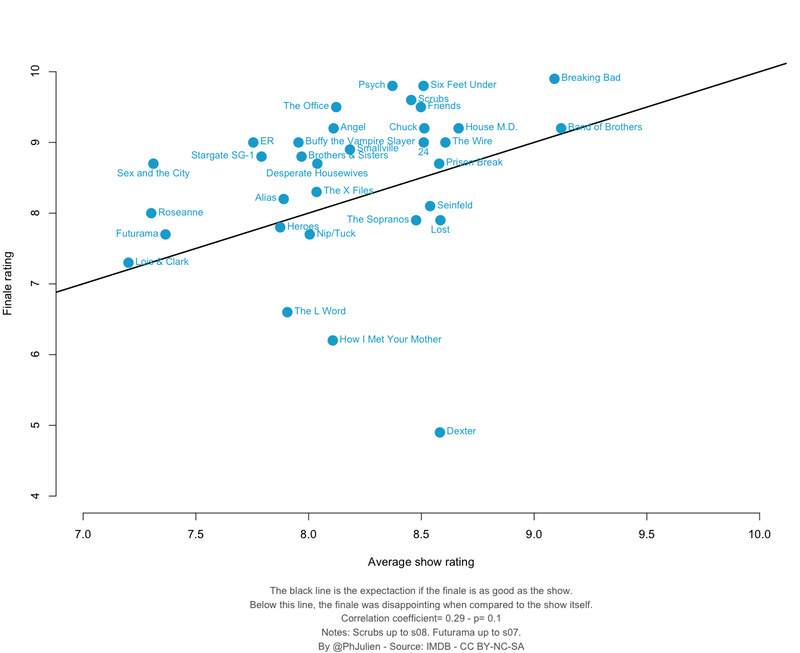 Looking at it this way the majority of shows go out roughly a little better than average (which is what viewers want). Would this work with British TV? No British show is in PhJulien’s chart, and only one in ChallengeResponse’s data – The Office (its US version is in PhJulien’s). Could I repeat this? Yes, but the difference is that US shows offer a much bigger sample size — the US version of The Office ran to 201 episodes, the UK version to just 12 and 3 specials. When you’re basing data on such small samples it gets a bit trickier, not least because the average for the finale is included in the series’ overall rating. That’s not a problem when the final episode is 1 out of 201, or 0.5% of all episodes and ratings, while the final of the UK version accounts for 7% of all ratings. Could I try this? Yes, but I think the findings are too risky. Still, it’s a great idea and one that could be used in other data reviews. You can get all ChallengeResponses charts and more (ranked by finale, season average and alphabetically) at Imgur. He also includes the links to doing it yourself by using IMDbPY and how he visualised it in iPython using matplotlib. You can get the source code for iPython notebook on GitHub. Previous: Explaining the news: is Vox top?